I knew the first one was bad so after not too long, I created this next diagram as a supplement that was meant to show the whole Scrum process all in one page. 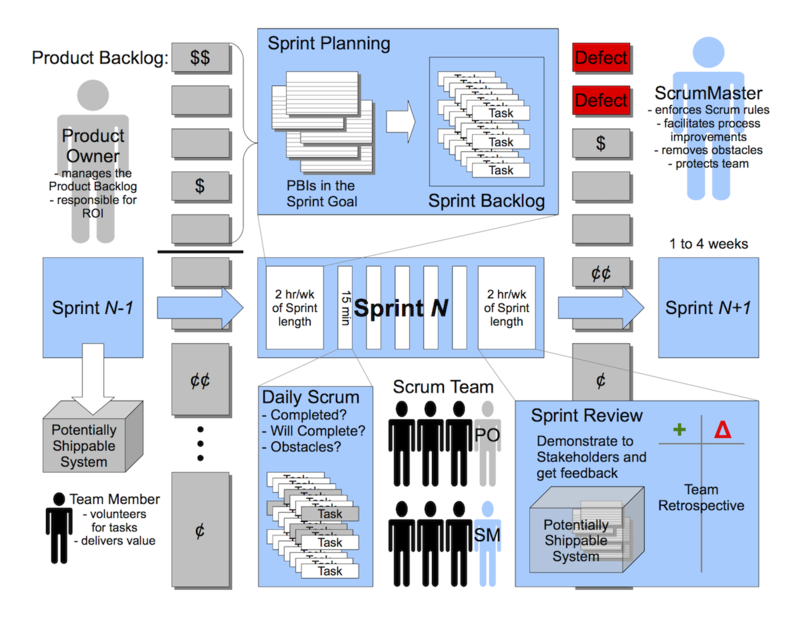 Similar to other Scrum “cheat sheet” style diagrams. I used this diagram until about 2008 when I got some very good feedback from a great trainer, Jim Heidema. The changes I made were small, but to me, significant. Changing from a “mathematical” language of “Sprint N”, “Sprint N+1” to a more general language of “Current”, “Future” was a big deal. I really struggled with that. Probably because I was still relatively new to being non-technical. 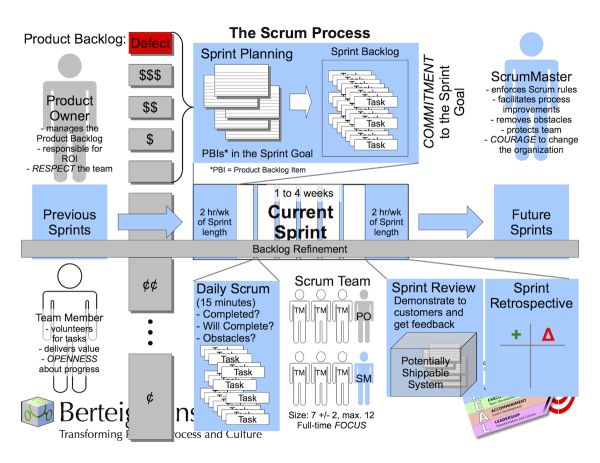 This fourth diagram made some minor formatting changes, but most importantly added “Backlog Grooming”. It’s funny how long I talked about grooming in my classes before realizing that it was missing from the diagram. I used the previous diagram and this diagram for a couple years each before making a rather major change to create the next one. 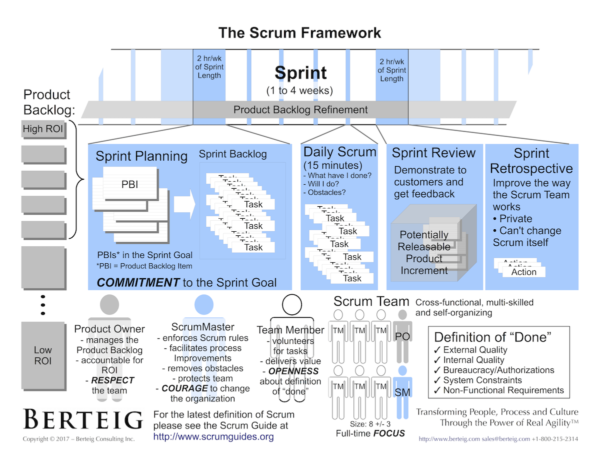 A couple years ago I realized that I wasn’t really talking about the Scrum values in my classes. I started to introduce them in some of my other handouts and discussions, but it still took a while for me to reflect those values in my diagram. 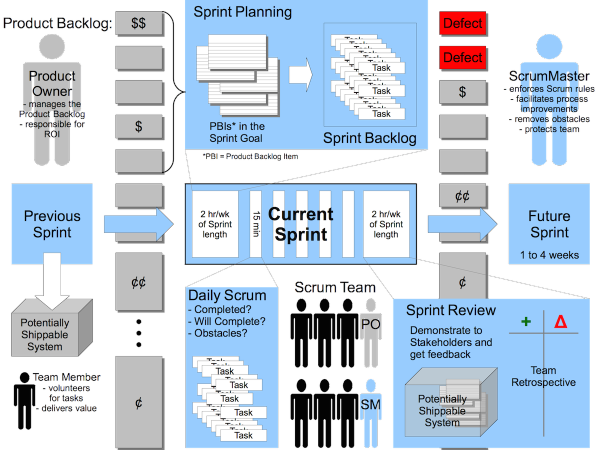 I had also received a lot of feedback that having two Product Backlogs in the diagram was confusing. Finally, I realized that I was missing an opportunity to use colour more systematically. So, a major reformatting, systematic colour coding and the addition of the Scrum values was my next change. In a rush, I added some logos to the diagram. Just made it gross, but it’s badness, combined with feedback about said badness, actually inspired a major change for the next version. I was showing my brand-new branded diagram to a bunch of people who really care about design and UX. The very first comment when I handed out the diagram was: “wow, you can really tell this wasn’t done by a designer!” Well, that got me thinking deeply about the diagram (again). So, here is my newest, latest and greatest (still not done by a designer) version of my Scrum diagram! 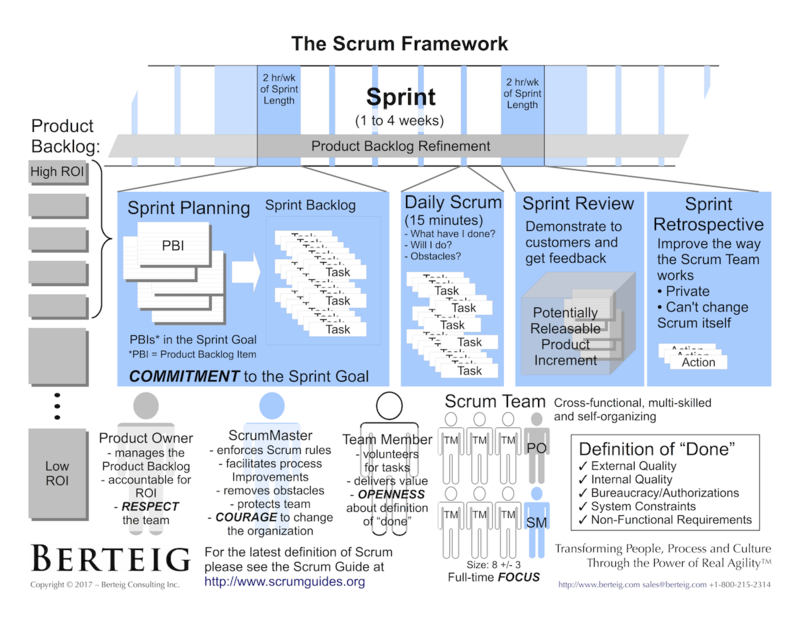 This new diagram represents many small changes including a much stronger focus on Scrum “by-the-book”. The most important and significant change is the addition of a bit of information about the definition of done. It also includes some other very minor layout and content changes, and updated branding (again) with the new BERTEIG logo. This one has been in use since some time in 2016, but I don’t remember the exact date. I would absolutely love constructive feedback about this latest diagram. Of course, if you like it, please let me know that too! The thing I like about this is that it is a way of looking back at almost 9 years of my teaching history. Continuous improvement is so important, so I welcome your comments! If you have your own diagrams, please link to them in the comments – I would love to see those too! In fact, it would be really cool if a bunch of people could make little “Evolution of a Scrum Diagram” posts – let me know if you do!!! PS. 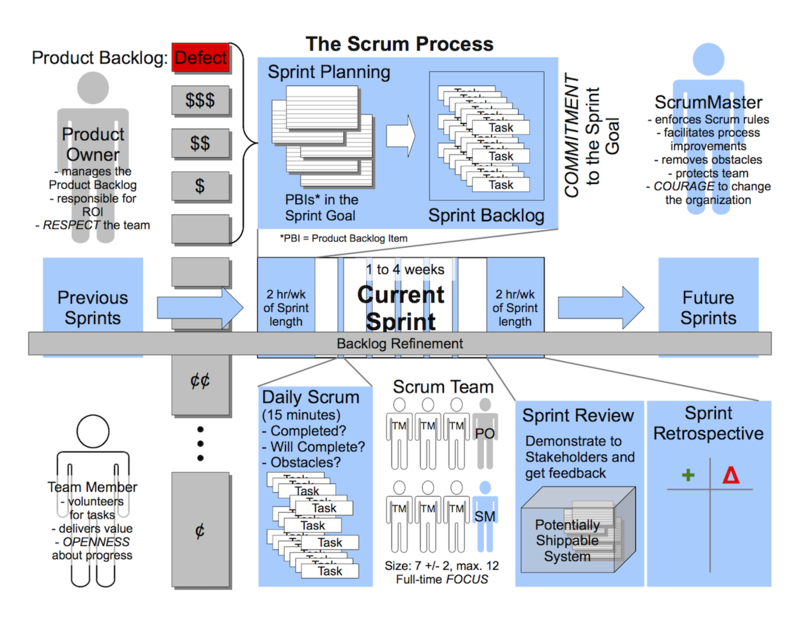 Here is a Scrum diagram created by my colleague Travis Birch. This Product Owner Simulation exercise rests on the idea that people learn a lot better by doing something than by talking about it. My Product Owner classes were getting great reviews, but I really felt like there was something missing compared to my ScrumMaster classes which have a full-day ScrumMaster simulation exercise. It took a little while to figure it out, but this article describes in detail how I do the simulation for the Product Owner class. I’m sure it will evolve and get refined from here since I have only used the simulation twice so far. UPDATE: 2016-08-14 – major updates to the Product Owner Simulation after having used it at least 15 times since this was originally written! UPDATE: 2017-07-13 – minor updates including new versions of handouts that better explain some concepts, and slightly expanded facilitator’s notes. NOTE: Permission to use this exercise / print associated materials is granted with a simple request: please link to this page on your blog, in a LinkedIn group or Google group, like it on Facebook etc. or write a comment in our comments section! Pre-requisites: None! No prior Scrum or Agile knowledge or experience required. 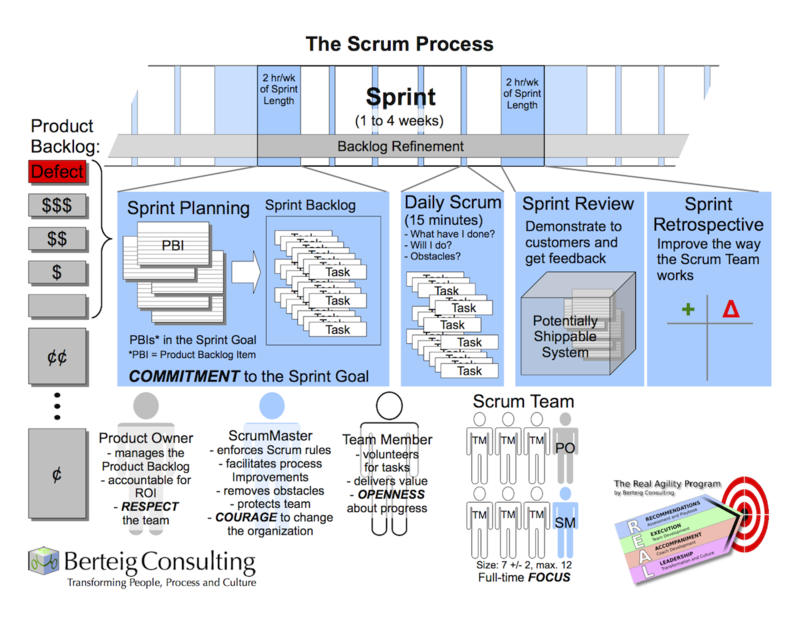 However, it is recommended that participants have an introduction to Scrum or have read the Scrum Guide. Audience: Product Owners, Business Analysts, Project Managers, Product Managers and other people responsible for business results and who interact with a Scrum team. Timing: This simulation takes at least 7 classroom hours. I usually run it from 8:30am to 5:00pm with a one hour lunch break and two 15 minute breaks during the day. Room Setup: Round tables with 5 to 7 chairs at each table. Materials distributed to each table. The purpose of the overall simulation is to learn to create a good Product Backlog in preparation for a Scrum team’s first Sprint. Many of the techniques we explore will also be useable in ongoing Product Backlog Refinement. Review the agenda with participants. 5 minutes – at table groups, think about the physical consumer products you know and use often. How are those products marketed and sold? How are they presented? How do you decide to use that product vs. a competitive product? Make sure you discuss specific products rather than corporate brands or product categories. Discussion: What Makes a Great Product Vision? 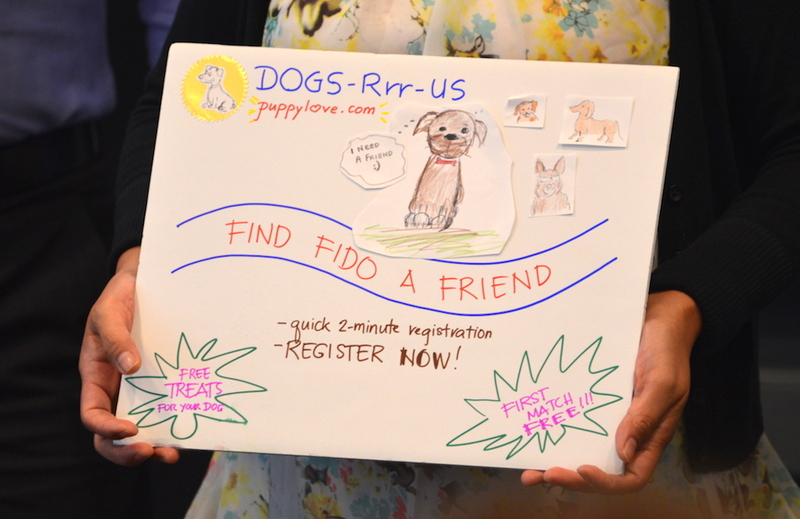 Give participants three product options (suggested options: “Doggy dating web site”, “iPad app for plastic surgeons’ medical and practice management”, “POS for food trucks with social features”). A table group must agree to one of the options. They will stick with this product for the remainder of the simulation. Three minutes to decide. 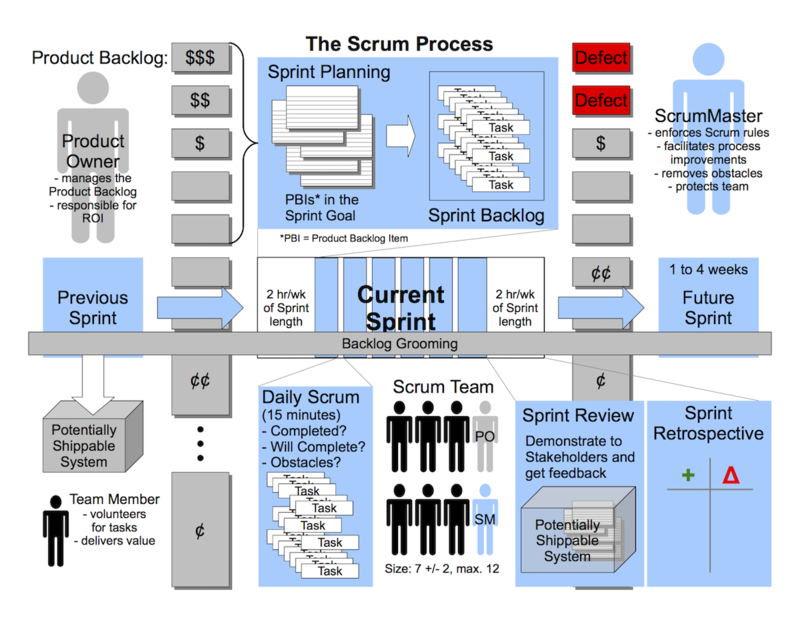 Remind participants that in Scrum, we don’t necessarily do all the steps of the simulation in any particular order. Instead, we are practicing techniques that can come into use at various times. The Product Owner Simulation must be done in a particular order. The techniques are all part of the overall process of Product Backlog Refinement. 5 minutes – attempt to craft a brief, compelling product vision statement that communicates “simplicity”, “urgency” and “emotion”. The audience of the product vision statement is your Scrum Team (NOT customers). Debrief by hearing from each group, then asking if the three characteristics have been communicated. Lecture: Explain the Product Vision handout and ask for questions, insights. At this time, highlight the differences between a “product” and a “project”. Emphasize the concept that a product has customers who pay money and who have choice about what they buy, and that those customers are outside of your organization. Possible discussion about Scrum being ideally suited for Product Development vs. project management or operations. 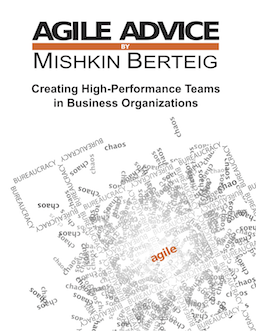 Talk about the need for a compelling vision as a pre-requisite for high-performance teams, and a way to decide what is in vs. out of a Product Backlog. Introduce “Product Box” as a way to do market research in an Agile compatible way (collaborative, light documentation, quick). Talk about the pattern of a product box: front to attract, back to showcase, sides to deal with objections. Use of online resources / web research is allowed but should not dominate the exercise. 30 minutes, with warnings at 15 minutes and 5 minutes remaining. Ensure that by 10 minutes in, the group has actually started using the craft supplies and isn’t just talking. 5 minutes – give additional time to allow groups to prepare for a trade show (in their market) presentation where other groups (or yourself) will role-play sceptical trade show participants. Focus on feasibility of using Product Box in real life, the power of metaphor, and the power of collaboration. 5 minutes – attempt to craft a brief, compelling product vision statement that communicates “simplicity”, “urgency” and “emotion”. Discussion: Debrief by hearing new Product Vision Statements. Describe “users we sell”, “users who pay” and “admin users” as the three major categories. Users can be in hierarchies where a general user type may have two or more specific sub-types. 10 minutes. One user of each main type, at least 5 users in total. More is okay. Introduce Persona concept (great reference: “The Inmates are Running the Asylum” by Alan Cooper). Usability as part of Agile, not separate (i.e. “working software”). Identifying personas as a way to build empathy from the development team to the end users/customers. 10 minutes. Choose a primary user. Generate name, age, background story, and relationship to product. Find an image from a stock photography site. Important: do at least a little bit of research and tie some part of your persona to that research! Try to be specific and write the background so it emphasizes the concept of empathy. Describe ROI, TTM and CSat as all-around good metrics. Explain red-yellow-green project dashboard and lines-of-code as bad metrics. Ask for other examples of good or bad metrics. 10 minutes. At table teams try to come up with at least 10 quantitative and 10 qualitative metrics. Use the handout as a worksheet. Focus on metrics relevant to the simulation product, but also consider metrics that might be from other businesses or viewpoints (e.g. finance metrics, marketing analytics, etc.). Throughout the classroom, share all the metrics and write them on a flip chart so they can all be seen at once. Ask for insights or questions about metrics. From the flipchart, each table team should choose 3 to 6 metrics that are most important to measure business success of their product. It’s okay for that short list to include ROI, TTM and CSat. Keep this list handy for the next part of the simulation. Discuss if/how Product Vision helped to choose the key metrics. If needed, allow a few moments for participants to reconsider the metrics they chose in light of their Product Vision. Use the product box, the user categories, and the business metrics. For each row in the worksheet, identify a feature, decide which user interacts with the product to exercise that feature, and choose the business metric that is most improved by implementing the feature. For each, decide if the feature is visible to the user through the user interface. The resulting worksheet should be filled up such that at least ten of the features are visible in the user interface. Use the example “As a Job Seeker, I can upload my resume, so that I get a job.” Explain the user story template based on the handout. Emphasize the idea of end user functionality. Explain user stories as an important tool, but optional part of Scrum. Usually some time is spent on a discussion about physical note cards vs. electronic tools – emphasize the fact that the note cards support the values and principles of the Agile Manifesto while electronic tools (typically) subvert them. Goal: 20 user stories for each group’s product, at least five user stories for the persona, and two user stories for each other type of user, all done in 20 minutes. User Stories must be written on 3×5 note cards with a 2cm blank area on right side of each card. The groups start by writing one or two User Stories together, then divide and conquer to create the rest. At the end of the 20 minutes, there is a brief amount of time allocated to making sure there are no duplicated “features” described. Workshop examples from each group. Ensure that the “benefit” section of each story does not contain a feature. Possibly discuss the three parts of a User Story as “who”, “what” and “why”. The benefit is usually related to time, money or happiness and connects the User Story to the product vision. Small means “easily and with certainty fits within a single Sprint”, large means “definitely requires more than a full Sprint of work”, and uncertain means either “uncertain size” or “uncertain if it will fit in a single Sprint”. Teams create buckets and sort all the user stories into the three buckets – they must role play being technical contributors (Development Team Members). Start by identifying one “small” one and one “large” one, then by dividing an conquering. Final step is to verify that the small ones really are small. Go through each of the “top” six splitting methods. Provide simple examples where the group needs help. E.g. error conditions as an example of splitting by business logic. Goal: result in at least 30 user stories, use each of the top six splitting methods at least once, give 15 minutes. Focus on splitting the items that were estimated in the “Large” or “Uncertain” buckets. Customers and business stakeholders estimate value, Scrum team members estimate effort, and ROI is the calculation of the ration of value over effort. Discuss examples of ordering based on these ratios, e.g. 8/2 vs. 8/4 and 200/20 vs. 20/2. Review process based on handout. 10 minutes. Goal: all user stories get a business value estimate written in the top right-hand corner of the user story card. 20 minutes. Goal: estimate 3 user stories using the Planning Game. Use the Bucket System to estimate the remainder with the ones already estimated as the reference points. Review ROI as a method to order the PBIs. Reminder that the Product Owner has final authority and can ignore the estimates in deciding on the order. 5 minutes. Just simple divide-and-conquer calculations of business value divided by effort for all the user stories. Lecture: Simulation Wrap-Up – Where Does This Fit? Reminder of the idea of creating an initial Product Backlog that is “good enough” to start the first Sprint. NOTE: Permission to use the Product Owner Simulation exercise and print associated materials is granted with a simple request: please link to this page on your blog, in a LinkedIn group or Google group, like it on Facebook etc. or write a comment in our comments section! If you are interested in experiencing this Product Owner Simulation first-hand, please consider attending one of our Certified Scrum Product Owner learning events.